It's no surprise that Philips Hue is our favorite smart light bulb — it's easy to use and works with almost any smart home setup. Now, Philips is making your Hue lights more interactive with Hue Entertainment. As the name suggests, Hue Entertainment synchronizes your lights with your entertainment of choice, from games to television. 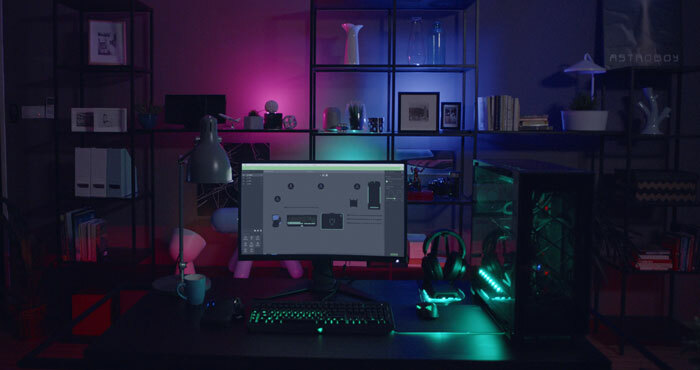 If you have color-capable Hue lights and a Hue V2 bridge, you can start using the first Hue Entertainment feature: compatibility with Razer Chroma gaming accessories. This is a fun feature for gamers, who can match the lighting on their Chroma keyboards (and other accessories) to their Hue lights. But that's only the start for Hue Entertainment. Later this year, Philips will be releasing the Hue Sync app for Windows 10 and macOS High Sierra, which will sync your Hue lights with whatever is on your computer screen. An updated mobile app with a new user interface and support for Hue Entertainment features will launch at around the same time. Hue Sync will let your lighting respond to games, movies or even your web browser. What we've seen so far does have some limits — for example, you're more likely to watch movies on your television than on your computer — but Philips says this is just the first step for its new entertainment options. Philips hasn't announced what else will join the Hue Entertainment lineup, but we would love to see partnerships with brands like Sonos and Roku. Having Hue lights that could talk to our speakers and smart TVs would add a lot more options on the entertainment front — and we hope to hear more soon. While somewhat less exciting than these new entertainment features, Philips is also taking Hue outdoors with a new line of outdoor lights. There are no details yet, but we would expect outdoor lighting to work similarly to indoor lighting: letting you set up colors, schedules and scenes for the perfect outdoor ambiance. Expect the new outdoor lights to show up on store shelves this summer, just in time for your next barbecue.